It’s a drizzly morning and as we stand in groups waiting for the van to the corral all eyes gaze skyward saying a silent prayer to stop the rain. Starting a trip like this wet is a bad omen, not to mention uncomfortable. 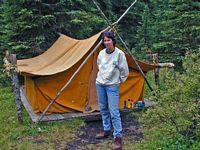 Once you’re wet camping in the mountains it is extremely difficult to get dry and if you are not truly dry there is no chance you will ever be warm. In 1978 Karen and I had taken this horseback trip in Banff in the Canadian Rockies with our best friends. This would be an opportunity to relive that wonderful experience with our adult sons this time and I envy their feelings as they see this awesome spectacle for the first time. The corral was a scene of excited anticipation; people of all shapes and sizes, from all walks of life, eager to get started on their ultimate adventure. The horses were selected to hopefully bear the size and weight of the riders and let us not forget that the temperament of the beast should also at least try to parallel the rider’s ability. Just give me a big strong horse that’s gentle as a kitten and I’ll be fine. A high adventure this will be. The mountains surround us on all sides as the trail winds its way up through the forest. 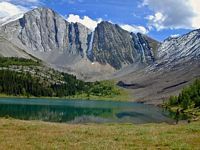 The clearings offer incredible vistas of rocky peaks and rushing mountain streams. Ah, this is paradise; no cars, no phone, no TV, nothing but fresh air and the occasional explosive horse fart. Mid-morning brought an end to the rain and a mountain meadow rest stop. Everyone in the group seemed overly eager to jump down off that horse and walk that awkward “ow, my bum” walk to stretch and recover because we all knew there was about five more hours of riding ahead. The break, aside from the well needed rest, gave us an opportunity to meet our fellow riders; families with kids, mother daughter and father son combos, and lone travellers. The break also gave us great coffee. You haven’t lived until you’ve had a mountain grown coffee brewed over an open fire. The horses graze throughout this stop and we get to see first hand how good the cowboys really are with them. The call comes to mount up and head it on out. For a few hours we ride along the mountain trails lost in the beauty of our native land. Lunch was also set in a phenomenal mountain paradise. 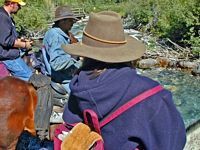 The cowboys unloaded red wooden crates from the pack horses and began unpacking pots and pans, dishes and food and anything else that might be required. 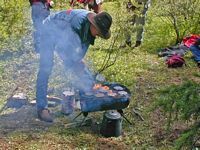 Nothing beats a burger cooked on a grill over an open fire in the clear mountain air. With each stop it got harder and harder to get back on the horse as that gnawing saddle sore feeling intensified as each hour passed. But it was just a couple of hours until we hobbled into Camp Mystic, our home for the next 2 nights. Greeted enthusiastically by the cook, we dismounted and faced our wilderness camping adventure with trepidation and wonder. After settling down in our tents, there was time for a quick orientation of the camp before dinner. It is in an open mountain pasture surrounded by tall pines. The canvas tents are pitched on wooden platforms to keep them up off the cold ground. There is a beautiful river running by and all thoughts of a quick bath were abruptly put to rest as I felt the icy water. A walk back to camp through the corral area, a last glimpse as the sun went down and we will soon be ready for dinner. Dinner was, as expected, incredible so, dressed in jeans and heavy sweat shirts, we retired to the campfire for an evening of relaxation, some pleasant conversation and more of that fabulous mountain coffee. It wasn’t that late, maybe 10 o’clock, but the day had been invigorating and we were all ready for bed. In the pitch black darkness the mountain night was extremely cold. Even though it is the middle of August the altitude neutralizes any heat of the day and the temperature plunges to near freezing. I slept better than I thought I would but it was fitful at best. It should come as no surprise that a Rocky Mountain breakfast is something that most people can only dream about. The trade off for this little morsel of Shangri-La is that the regular morning rituals of washing, shaving and brushing your teeth are conducted in the crisp mountain air; make that freezing mountain air. Well, it’s guaranteed to wake you up. We eagerly look forward to our adventure today; a day trip to the Forty Mile Pass with lunch at Rainbow Lake. The trip up to the pass was magnificent as we climbed steep, rocky, narrow paths. A long uphill battle for the poor horses but all you as a rider have to make sure of is that you don’t fall off. Lean forward to the point of lying down on your chest. This will distribute your weight and make it a little easier on the horse but it also allows you better balance; remember it’s a long way down and I don’t just mean off the horse. As we approached the pass the lush green carpet of the forest unfolded to reveal the rugged peaks of the most beautiful mountains imaginable. 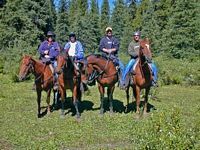 We rode into an open meadow on the shores of Rainbow Lake, our lunch stop for today. You can’t help but feel you’ve found your own little piece of Heaven here on Earth as you gaze across the water. As we dismounted I noticed that our son Gavin did not appear to be particularly happy. This struck me as odd so I asked him if he was alright. At first he said he was fine but my annoying persistence revealed that he had a bad migraine. He said he would be okay just to sit by the lake at lunch. Lunch was very enjoyable on the shore of this high altitude pristine lake. Adam, our other son, and one of the wranglers decided to climb a nearby peak while we sat and reveled in the stunning scene around us. They climbed, Gavin tried his best to feel better and enjoy the atmosphere and Karen and I relaxed and took photographs. The trip back was a challenge. Coming up the mountain was a balancing act but going down was a circus show of significant magnitude. The trail is very steep and very rocky. You have to lean back on your horse as far as you possibly can with your feet and legs fully extended in the stirrups. You also have to fully commit yourself and accept the fact that your horse is a sure footed animal. Even when their hooves slip on the loose rock, which happens with alarming frequency, you have to have faith that the animal’s instincts will prevail. Imagine having to do all this with a debilitating migraine, which is indeed what Gavin had. The ride down, which lasted over two hours, was hell on earth for him. Traditional treatment for a migraine is dark, cool and quiet surroundings. Gavin was devastated as he had to stay on his horse in the incredibly bright sunshine, hot temperature and undergoing the sharp jarring and bouncing in the saddle with every step the horse took. Add to that the high altitude and, well, you do the math. He had to stop several times to throw up. I don’t know how he was able to persevere or even stay on his horse. It was one of those situations in a parent’s life when you look on, wishing you could trade places with your child so he does not have to suffer, even though he is an adult. When we arrived back at Camp Mystic Gavin took some fast acting medication and immediately fell asleep in his tent. As we waited for dinner we went out to the corral and watched the cowboys repair and re-shoe some of the horses. It was quite a treat for a bunch of city slickers to watch them pry and file and hammer the horseshoes back onto the horses. Dinner again was amazing. There is something about a day of fresh air and invigorating activity that makes a hearty meal a culinary achievement beyond reproach. After dinner Karen explained the situation and asked the cook if she could save something for Gavin for later. Not only did she save something she put an entire full course meal away for him to enjoy once he felt better. We enjoyed another evening around the campfire. The conversation inevitably turned to how cold it had been sleeping the night before. The cowboys shared a mountain secret with us and told everyone to put a fist sized rock in the fire. When you go to bed, put the hot rock from the fire in a woolen sock (it will not burn the sock) then put it in your sleeping bag with you. I personally chose not to do this but those who did say it worked well. At about 10 o’clock Gavin came into the fire circle. He said he felt like a new man and you could tell by the sparkle in his eyes that he felt fine. He was extremely pleased with what the cook had done and sat down at the fire to enjoy his delayed but delicious dinner. After another hearty breakfast it was time to pass the hat around and gather tips for the cowboys and the cook. With a final thank you to the cook we were saddled up and hit the trail. The ride back followed a different route than on the way in so we did not go over any of the same ground. Still sore but starting to get a better feel for the horses was a strike of good luck, especially for Karen, as we stopped on the trail. The horses were nibbling on the grass along the side of the trail when suddenly Karen’s horse bolted up and took off down the trail. Karen was able to rein him in and slow him down as the cowboys took off after her. Apparently there is a beehive in the grass beside the trail and the bees either spooked or stung the horse. No harm done; just a little morning excitement in the Rockies. Our last lunch on the trail brought a fabulous photo opportunity for a truly unique family portrait. I can almost hear the theme to Bonanza playing every time I see this picture. 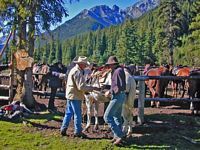 The remainder of the ride was uneventful as we forded streams and rode past Mount Norquay into the valley corral. With final goodbyes to our fellow riders we hopped in the van back to the Trail Rider Store. As we entered the store to check out we noticed a very strong aroma, a very pungent smell of, yes, horse manure! At first we thought it was the store but quickly realized it was us! Wow! We didn’t notice it earlier because everyone smelled like that but now that we were back in the city it was very dominant. Hah – a bonus for all the tourists shopping in the store. It was now very obvious that we were all badly in need of a shower and a change of clothes so we called it a day and headed back to our hotel.